Nobody does Christmas like the Germans, and for good reason. 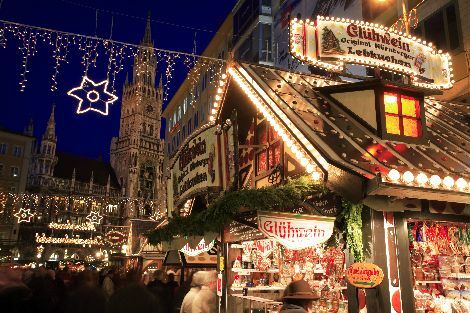 All over German speaking Europe, but especially in Bavaria, the tradition of the Christkindlmarkt (Christmas market) goes back 700 years. 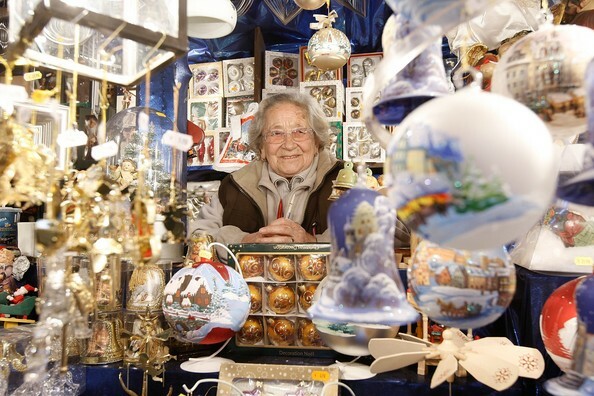 In town squares throughout Germany right now, local craftsmen and merchants are setting up Christmas markets as they have done since the Middle Ages. You can warm up with some Glühwein (mulled wine) like your medieval ancestors did at Munich’s annual Christmas Market. Unlike our modern “Black Friday” Walmart riots, the traditional Christmas market is a peaceful shopping experience where you can buy unique hand made crafts, sip mulled wine, and enjoy good music. And there is an unapologetic focus on the spirit of the season, and on the Christ child – Christkindlmarkt literally means “Christ child” market. It was actually the German protestant reformer Martin Luther who decreed that gifts should be given on Christmas Day in celebration of the birth of the Christ child rather than on St. Nicholas’ Day (Dec. 6) as had been the tradition. Friendly Liselotte Groemer has been selling handpainted christmas ornaments at the Nuremburg Christmas Market since the 1950’s. 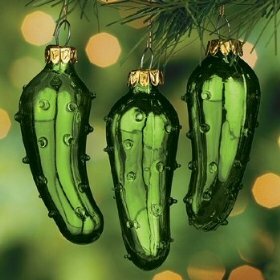 The Christmas pickle ornament – a unique German tradition. With a central nativity display (an imported tradition from medieval Italy – details in a future blog) and a beautifully decorated Tannenbaum (Christmas tree – a German original), the Christmas market is an oasis of light and love for locals and visitors alike. 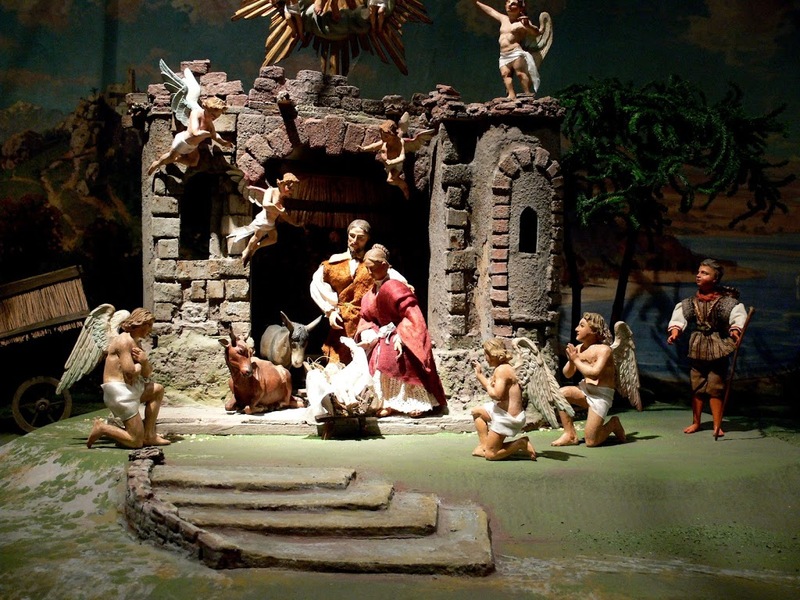 Beautiful hand made nativity scenes are on display and on sale – reminding visitors of the “reason for the season”. Rothenburg ob der Tauber, a walled medieval town on Bavaria’s Romantic Road, attracts visitors from all over the world to its Christmas market. The town itself is a beauty all year round, but with a light dusting of snow and the ambiance of the market, it becomes irresistible. And even if you don’t visit during the Christmas season, you can experience it year round in the seemingly endless rooms of the Käthe Wohlfahrt store across the street from city hall. The store offers every conceivable Christmas ornament, decoration, doll, window display… you’ve never seen anything like it! 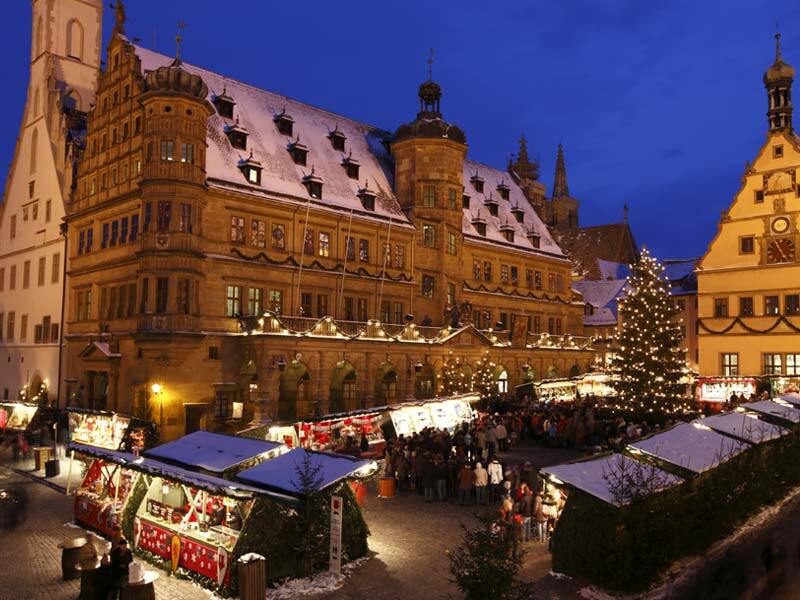 Bordered by the town hall (on the left) and councilors’ tavern (on the right), the Rothenburg Christmas Market is an annual tradition going back to medieval times when these buildings were constructed. Deep within the store is the Rothenburg Christmas Museum – 2700 square feet of Christmas history that will have even the youngest visitor nostalgic for the “old days”. A visit to the museum evokes a lightheartedness, a feeling of warmth and goodwill, with none of the “stresses” of our modern holiday, even in July! I’ve seen many of my tour members walk out of the museum into a warm midsummer Rothenburg street humming “Silent Night” and pining for cold air and hot chocolate! 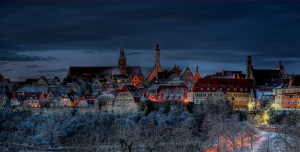 es a two night stay in romantic Rothenburg – join us! From outside the town walls, Rothenburg looks like the setting of a fairy tale, whatever the season!